Weber has assembled an economical collection of oil painting essentials all in one box. 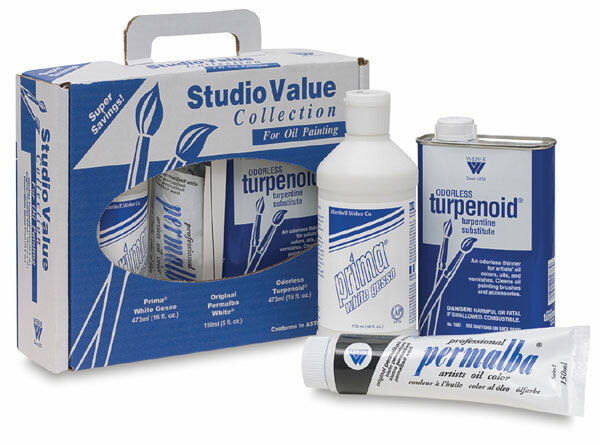 This collection contains the following painting materials: Prima Gesso, 16 oz bottle. Permalba White Oil Color, 5 oz tube. Odorless Turpenoid, 16 oz can. Weber has assembled an economical collection of oil painting essentials all in one box. 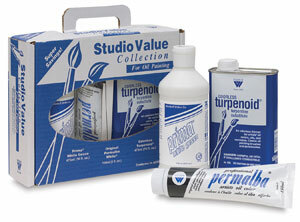 This collection contains the following painting materials: Prima Gesso, 16 oz (473 ml) bottle. AP Non-toxic, Permalba White Oil Color, 5 oz (150 ml) tube. CL Cautionary Label, and Odorless Turpenoid, 16 oz (473 ml) can. CL Cautionary Label.